Are you like most race fans - depressed that the season is over? Do not despair! There is a way to get your fill of NASCAR and keep your mind sharp until the green flag drops next February. 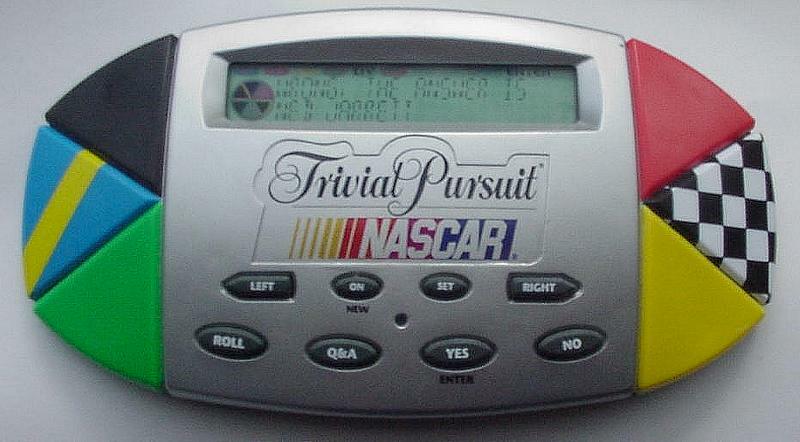 For my last birthday, I received a NASCAR Trivial Pursuit game. Now I don't waste a single minute sitting around thinking about how I miss the racing. The game is an electronic hand-held version of the traditional Trivial Pursuit board game. It is oblong in shape and consists of 8 buttons with an LCD two-line screen. You can play one of four versions of the game, including knockout multiple choice, knockout traditional, team play and questions and answers. Knockout refers to the process of having one of six question categories eliminated when you miss a question in that category. Categories consist of NASCAR, pits, teams, tracks, drivers and wild card. To initiate a question, you press the roll button that randomly selects a category for you. If you incorrectly answer a question about tracks, for instance, that category is removed from the game. You keep playing until all six categories are eliminated, and then your score is recorded as the number of questions you have correctly answered. The knockout traditional version is more or less a true/false contest, while the multiple choice version lets you pick from four answers. The buttons allow you to scroll through the answers or repeat the question before making a selection. Over the past two months, I have played the multiple-choice version extensively, and let me warn you that NASCAR novices will not be setting high scores. The questions generated by this game are not softball pitches that can be easily knocked out of the ballpark. The game requires knowledge of both the details and the history of stock car racing. In light of that fact, I will not tell you what my high score is. I'll leave you to set your own records. I have played this game at least a hundred times, and surprisingly it has very rarely produced repeat questions. The game can be played with or without the beeping sounds. This is a bonus if you are playing in an office or in a car with others. Although listed at a higher price, the game I received was purchased on sale for less than $10 at a major toy store chain. This version is current through the 1999 season. I would recommend this game as a stocking stuffer for any stock car racing fan. It's fun, entertaining, portable and a great learning experience. And by the time the Daytona 500 rolls around, you will know more about NASCAR than any other fan in your cheering section. Trivial Pursuit is copyrighted by Horn Abbot, Ltd., under exclusive license to Hasbro, Inc.